Deborah Yager Fleming, CEO of Acqualina Resort & Spa on the Beach since its opening in May 2006, has established it as an ultra-luxury boutique hotel catering to the world’s most discerning guests by providing impeccable service, lavish accommodations and a friendly, engaging staff. 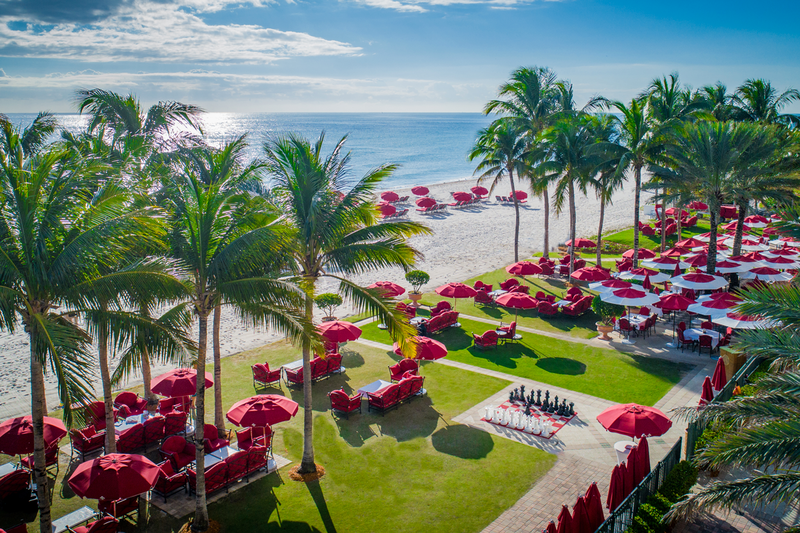 Acqualina is located on 4.5 beachfront acres with 400 feet of stunning Atlantic Ocean coastline in Sunny Isles Beach, Florida. 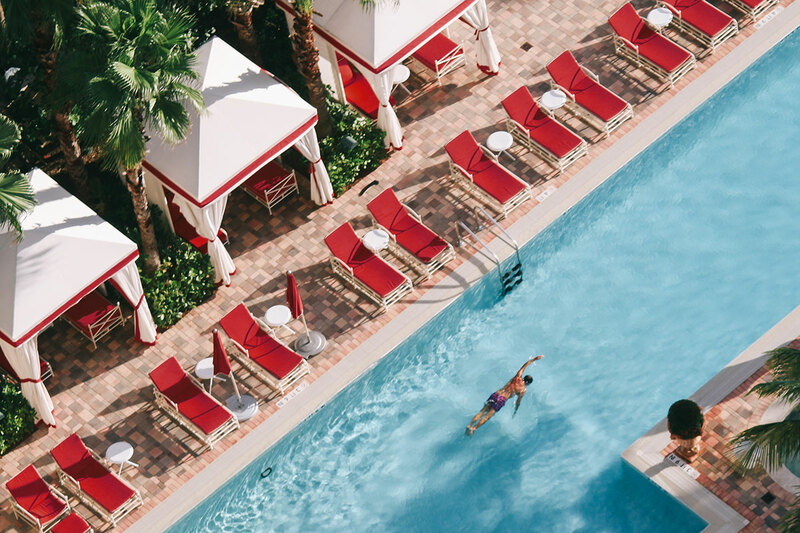 Situated between Miami and Fort Lauderdale, the resort is just minutes from the world-famous Bal Harbour Shops and Aventura Mall. The vibrant daytime activities and nightlife of Miami Beach, South Beach, Hollywood and Fort Lauderdale are a short drive away. Link to interactive map with attractions and distances. 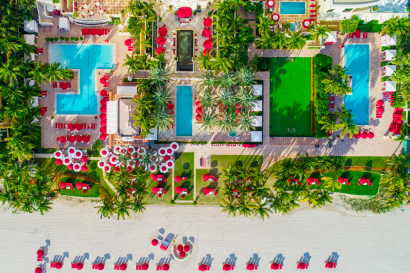 Acqualina’s Teen Scene brings together kids ages 12-16 and specializes in themed events such as beach volleyball, dance and hip hop classes, art classes, speed and agility training and more. It’s the perfect place for teenagers to bond with other like-minded teens staying at the resort. 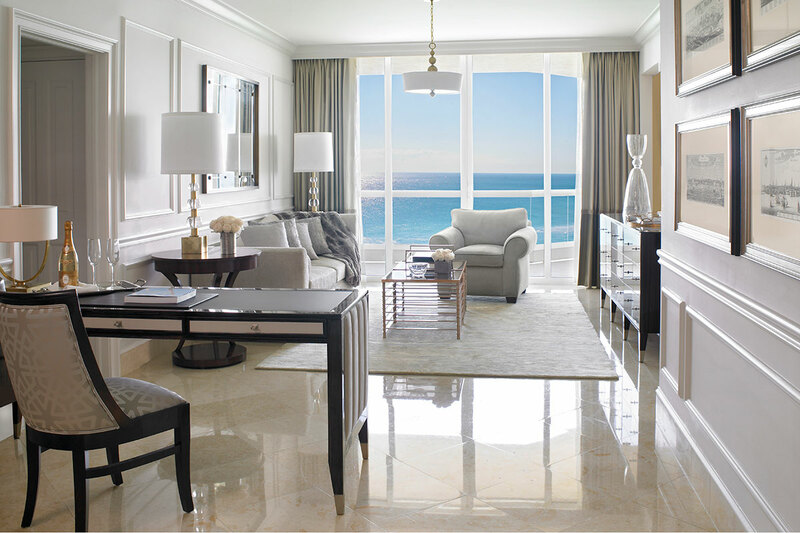 • 24 Intracoastal Rooms, face west looking out to Collins Avenue. 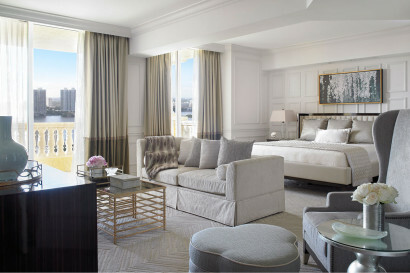 They feature a king-size bed, a sitting area, a private terrace, Jacuzzi whirlpool tub and glass-enclosed shower (600 sq. ft. enclosed area; 740 sq. ft. with terrace). 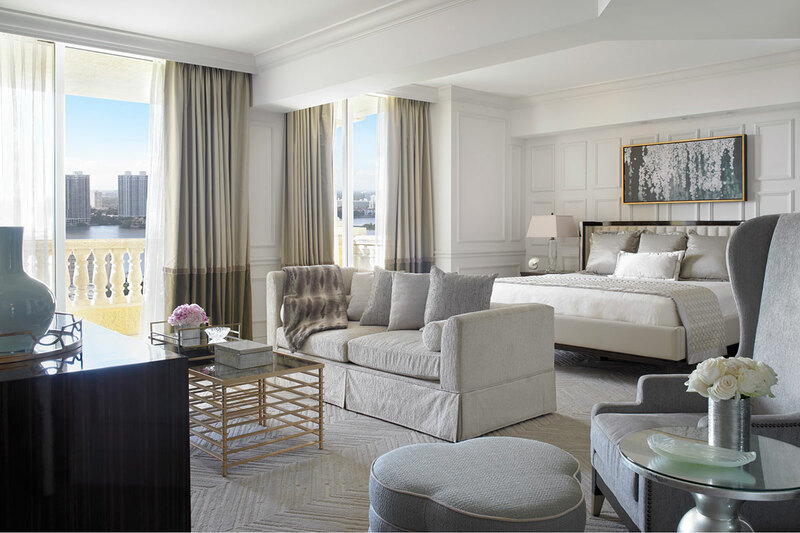 • 22 Deluxe Intracoastal Rooms offer Intracoastal Waterway vistas, king-size bed, sitting area, private terrace, bath tub and glass-enclosed shower. Some rooms feature dividing French doors between the sitting area from the bedroom (600-740 sq. ft. enclosed area; 740-855 sq. ft. with terrace). • 8 Ocean Front boast an oceanfront view, king-size bed, foyer area, sitting area, writing desk, private terrace, a custom vanity area, bath tub and glass-enclosed shower (615 sq. ft. enclosed area; 725 sq. ft. with terrace). 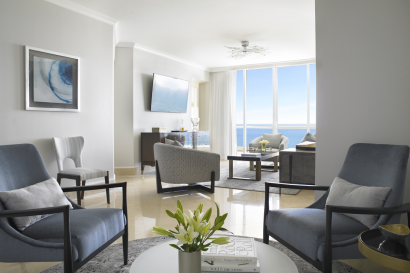 • 4 Classic Suites are one-bedroom oceanfront Classic Hotel Suites featuring a king-size bed, separate living room, two flat-screen TVs, private dining terrace and 185-sq.-ft. bathroom, custom vanity area, bath tub and glass-enclosed couples’ shower (1010 sq. ft. enclosed; 1180 sq. ft. with terrace). • 2 Deluxe Three Bedroom Ocean Front Suites, 2,375 sq. ft, featuring private terraces with stunning views of the Atlantic Ocean, are each equipped with a large living room, two sitting spaces, a media area with a large screen TV, gaming consoles, embedded DVD and Blu-Ray player, a wine bar station, a full gourmet kitchen (with all the high-end implements) and fully stocked mini bar. The dining area seats six persons with bay window and floor to ceiling views of the ocean. The oceanfront master bedroom and bathrooms are outfitted with the best luxury features and latest technology. • 24 Two Bedroom Oceanfront Suites offer a master bedroom and second bedroom both with king-size beds, separate living room, custom curved sofa sleeper, taupe lacquer credenza with integrated media connectivity, smoked glass and bronze metal coffee tables , dresser and desk with bronze glass inlay, desk, desk chair, high-definition TV’s, entertainment unit, private bar, sitting area, private terrace, gourmet kitchen (with Sub-Zero built-in refrigerator/freezer, designer granite countertops with full backsplash, Italian limited-edition cabinets, microwave, dishwasher, stainless-steel sink and garbage disposal), breakfast room, powder room and two full bathrooms outfitted with imported marble flooring, double sinks, custom vanity area, bathtub and glass-enclosed shower. The master bedroom offers oceanfront views and the second bedroom offers Intracoastal views. Also features a convertible den with writing desk and a twin-size bed. (2035 sq. ft. enclosed area; 2379 sq. ft. with terrace). The new rooms and suites are dressed in cool, calming tones featuring a selection of traditional furnishings in a deep ebony color, finished in a rich, high gloss lacquer with inflexions of bronze jewel tones. 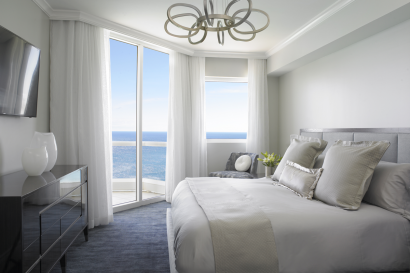 Satin draping will frame windows and sliding glass doors that give way to oversized balconies with views of the ocean or Intracoastal Waterway. Glamorous detailing includes channel tufted walnut wraparound headboards, curvaceous pillow back sleeper sofa, a Chinchilla blanket, and signature wingback chairs fit for a prince or princess. • 1 Grand Deluxe Three Bedroom Suite which is a one of a kind accommodation with the breathtaking views of the Atlantic Ocean. The suite’s elegant styling and contemporary glamour carry the magnificent ocean grandeur throughout the interior design with its luxurious contemporary fabrics, soothing color palette, and marble. The elegant entry foyer with chic marble flooring has three round mirrored sconces, linear polished nickel light fixture, and hand-painted wallpaper. The suite’s expansive living room features modern end tables with a geometric design pattern, a 65-inch 4K TV and a flush mount chandelier. Elegant drapery adorns the floor-to-ceiling window. The sitting area has a queen sofa sleeper with quilted back cushions and accented pillows, antique brass coffee table and an area rug. There is also a serene gathering area with a sleek writing desk and lounge chairs for four. There are three bedroom options including an oceanfront master bedroom with a king-size bed, a large bedroom with two twin beds with a wall-to-wall panel and a bedroom with a queen bed. All beds are outfitted with Frette duvet covers in light grey. Plus, there are three private bathrooms. The oceanfront master bedroom with terrace access is furnished with a midnight blue rug, a king bed, walk-in closet, side table with nightstand, high definition TV and a sparkling chandelier reminiscent of a jewel box with its exquisite ring pattern. The master bathroom features imported marble flooring, beautiful chandelier, double sinks, custom vanity area, bathtub, and glass-enclosed shower. 2,031 sq. ft. (188.7 sq. m) of an enclosed area; 2,375 sq. ft. (220.6 sq. m) with a terrace. The moment guests arrive at AQ Chophouse, their eyes will be instantly drawn to the giant, 1930s art-deco style chandelier that hangs from the soaring ceiling. 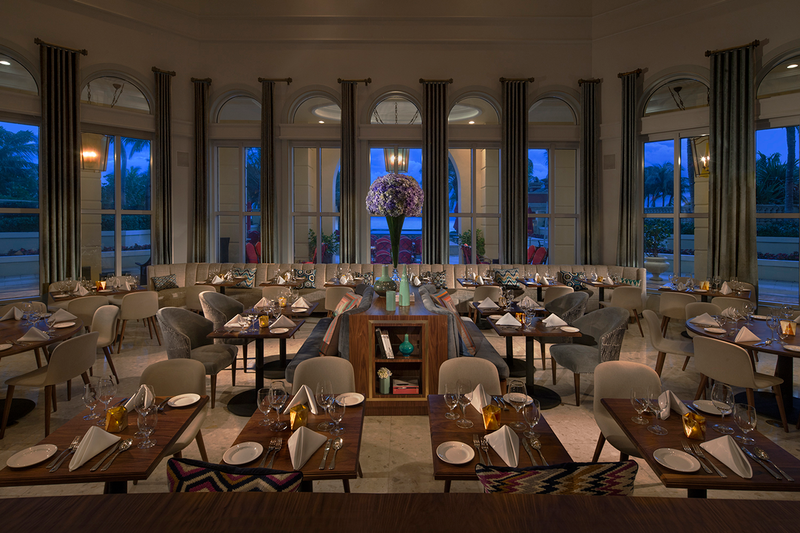 The sweeping ocean views and natural light pouring in through the majestic windows highlight the handmade walnut dining tables and plush seating. Designed by Miami-based design firm Saladino Design Studios, AQ Chophouse was inspired by a throwback to mid-century European design, culminating in a cross between the bold, modern designs of the 1970s and the quieter style of 19th century Italian residential classicism. Join us every Sunday from 12:00pm to 4:00pm at AQ Chophouse for a special brunch buffet by Il Mulino New York while enjoying live music. Adults $85 (unlimited Mimosas, Prosecco, Mojitos and Bloody Marys), children ages 13 and under $35 (tax and gratuity not included). An idyllic match for the elegant Mediterranean style oceanfront Acqualina Resort, acclaimed Italian restaurant Il Mulino New York is renowned for its bustling and energetic atmosphere, market fresh daily specials extensive selection of fine Italian wines and impeccably polished wait staff. 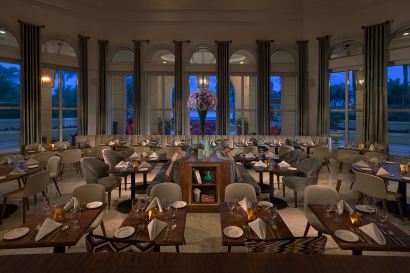 Il Mulino New York at Acqualina Resort and Spa has been awarded the Forbes Travel Guide Recommended Award for its exceptional dining experience. Il Mulino New York has been honored as the #1 Italian restaurant on the New York City Zagat Survey for an astonishing 20 years. Join us every Sunday from 12:00pm to 4:00pm in AQ Chophouse for a special brunch buffet by Il Mulino New York while enjoying live music. Adults $85 (unlimited Mimosas, Prosecco, Mojitos and Bloody Mary’s), children ages 13 and under $35 (tax and gratuity not included). To make a reservation, please call 305.466.9191. The oceanfront Costa Grill is the perfect spot to enjoy a beachside lunch, a light snack or to relax and unwind with a cocktail as the sun sets. 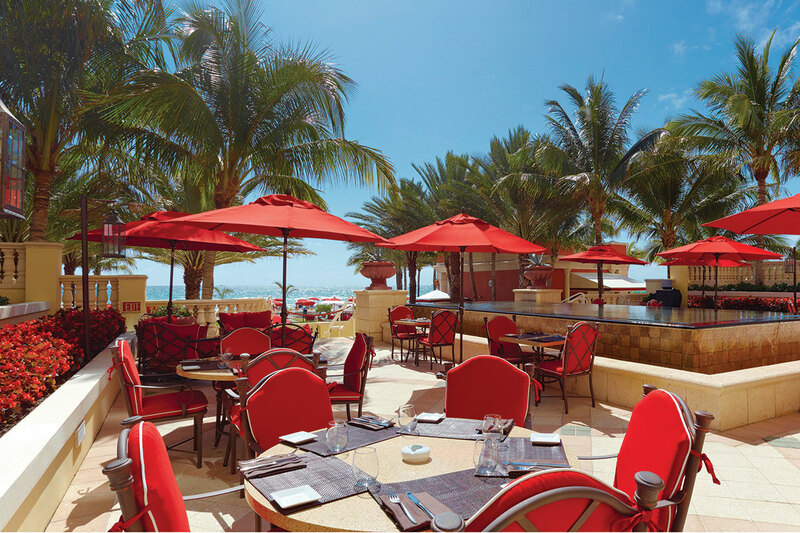 The beachfront Miami restaurant serves an array of gourmet cuisine including sandwiches, burgers, wraps and salads in a casual setting. 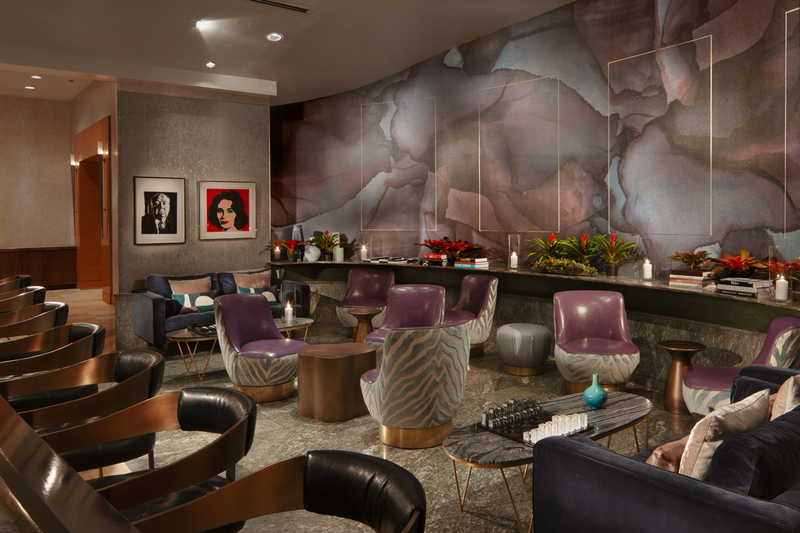 • Groundbreaking in design and cutting edge in spa expertise, the luxurious 20,000-square-foot two-story Acqualina Spa by ESPA overlooks the glistening Atlantic Ocean and provides guests and outside clients with a tranquil sanctuary. Acqualina Spa by ESPA combines the best of ancient and modern therapies with the latest and finest skin care advances. 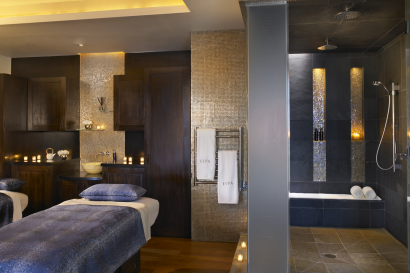 The ultimate treatment choice, ESPA Time, commences with a Welcome Foot Ritual where the client’s needs are established, resulting in tailored treatments and a completely customized experience. All treatments are enhanced by a full line of ESPA marine, aromatherapy and plant active products blended using the highest quality organically grown plants, known for their purity, potency and exceptional results in skincare. The spa features his and her locker rooms equipped with sauna, steam room, his and her relaxation lounges, and an outdoor spa veranda with outdoor spa pools. 2013 Travel + Leisure World’s Best Hotels in the Continental U.S.